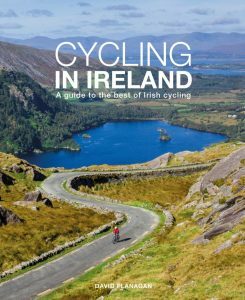 Author, publisher and keen cyclist David Flanagan has produced a book which, he says, documents the best cycling Ireland has to offer. 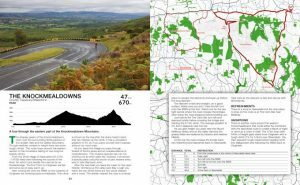 With eighty routes across the island covered, it certainly is a comprehensive guide, jam packed full of spectacular rides, no matter what mode of cycling you prefer. Off road bike trails, gravel paths and road trips are among the options explored and each route includes a map, turn by turn directions and details of what you might expect to find along the way. As an added bonus, a downloadable GPX file,which can be saved to your smartphone or compatible bike computer, is also provided (via the author’s website). It’s obvious author David Flanagan has meticulously researched the routes and there are superb photographs to do each of them justice. Glossy paper is used throughout and the book has clearly been produced with the highest of production values. As a road cyclist myself, who loves climbing and is always looking for new challenges, I was particularly interested in the road cycling aspects of the book, but really, there is something for everyone here. 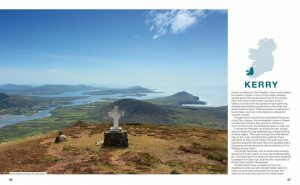 The book has useful advice for newbies and experienced cyclists alike, with sections on family cycling, bikepacking, the Wild Atlantic Way and Ireland’s growing number of greenways and canal towpaths. I’m planning a cycling based stay-cation in September: this book is coming with me.